The company was established in 1977 by Mr. S. D. Deshingkar & has two plants. He was B.E. (Mechanical) from College of Engineering, Pune (COEP), one of the oldest and most prestigious engineering colleges in India. After graduation he joined Tata Steel (TISCO), Jamshedpur. After having a glorious carrier for more than 20 years, he decided to return to his home land and started Bhavani Iron Industries. Bhavani Iron Industries is well known for graded Cast Iron hand molded casting due to its rapid development capabilities, timely delivery and excellent quality. 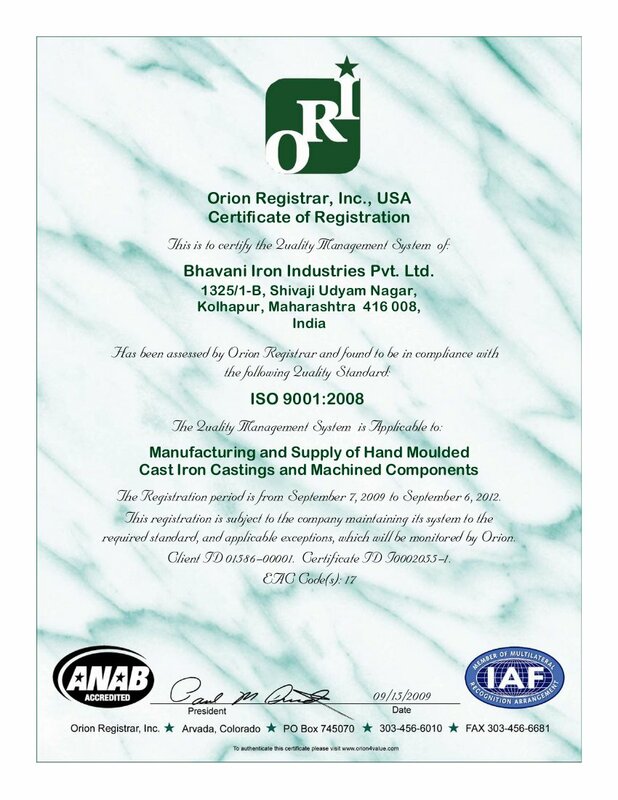 The company has acquired an ISO 9001:2008 certification. It is located in the city of Kolhapur in Western Maharashtra (India). After significant expansion in production capacity we have recently added in-house machining facility. We have all required facilities available under one roof. The company is presently managed by Sham & Shrirang Deshingkar. Sham is B.Tech. (Mechanical), from Indian Institute of Technology (IIT), Bombay. He has over 20 years of experience in the Industry. Shrirang is M.Sc. from Indian Institute of Technology (IIT), Bombay. and Ph.D. (Physics) from Tata Instite of Fundamental Reseach, Bombay. We have deep knowledge of metallurgy, methoding & cupola operation. We apply our innovative ideas & research mind in our foundry for several in house developements & improvements. We have a team of committed professional personnel for rapid development and timely delivery of quality castings. In 2018 we have started second plant to meet growing demand. The plant is spread over 60,000. Sq. Feet of land at Five Star M.I.D.C. Kagal. We have capability to produce castings up to 7000 Kg single piece in this plant. Our aim is to supply fully machined, ready to use components for projects and heavy engineering industry. After starting the foundry, in next phase we plant to extend our machining facilities.